Goal setting is a gifted skill for the person. Goal setting is crucial for continual growth, great motivation, and self-confidence. It is a way to achieve an objective you have not learned yet. A goal is the desired result that a person visualizes as a future possibility, plans and then commits to achieving that desired result as set previously. The setting of goals is extremely necessary to move on properly and efficiently in life. The goals need to be relevant. Submitting to a goal will lead the person to specific outcomes. A person needs to ensure that goal shall be finished within time, a person must set a deadline. We tend to live busy lives with full schedules. This alters into putting things off that do not have a sense of a specific timeframe for completion of any accomplishments. Both the setting of the goal and working dedicatedly to implement those are equally important. Following the conventional path for the achievement of the goal is of absolute significance rather than setting the goal and not following the right path to achieve it. Choose the right path. Seize every single opportunity to fulfill your dreams. Make a difference. Stay motivated. 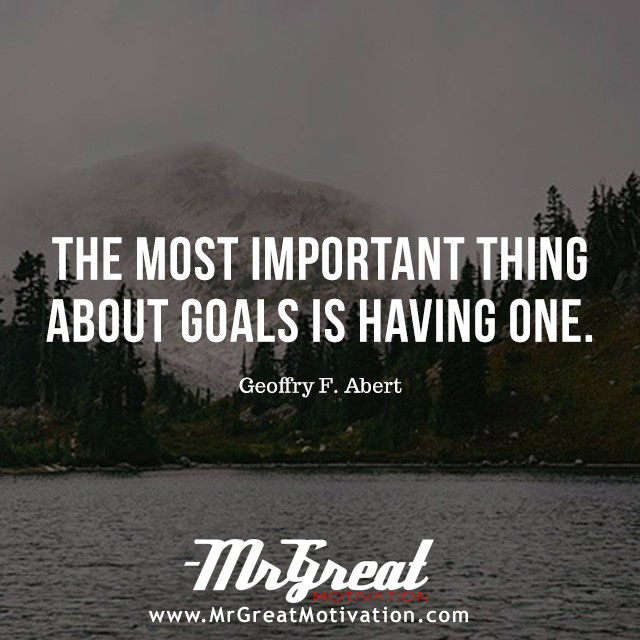 We hope guys you find Quote "The most important thing about goals is having one. - Geoffrey F. Abert" by Mr Great Motivations useful. If you think we have made some efforts, then don't forgot to appreciate us by sharing this Quote with your friends and family, And thanks for visiting.